Condition is Used. Price is quite low for laptop with such specs due to defects listed above and laptop being 3 years. In my opinion. built quality, performance and size for laptop with gtx 980 are main strengths of this laptop, while battery is the biggest weakness. Aorus X7 V2 Gaming Laptop. However the bottom part of the body of the laptop is slightly bowed due to a previous battery issue which has been fixed by the manufacturer. Its barely even noticeable and does not impair your use of the laptop. AORUS X5 V7 60hz 4k panel pantone Gtx 1070 7820hk 4.3 over clockable!! Quad core 8 thread 16gb ram It's been liquid metal'd for max cooling Fully back lite keyboard Been great for gaming at work Only down side is the battery life witch is around 2.5 hours max so it's always plugged in for gaming Great condition just a finger print magnet comes with box and power cable. No returns so do ya research before buying. Processor: Intel Core i7 Extreme 6th Gen.
No screen. Can use like a pc with hdmi. AORUS Overclock | Laptop Overclocking Made Easy It is mind blowing to know that the insanity does not stop here. Take it to the next level when others can’t provide and be part of the overclocking performance sensation. AORUS X7 GAMING LAPTOP - GEFORCE GTX 1080 - CORE I7. AORUS X7 Gaming Laptop | Armoured For Gaming. "Explore new horizons with AORUS. Each and every key can be customized to light up only the required keys for each application, allowing the user to instantly identify which keys to press. The base of the Aorus is in excellent condition too, with all rubber feet present. The Aorus is a lovely piece of kit and you wont be disappointed. 512GB HDD Storage. 16GB (2 8GB) DDR3 RAM. The Auros X5 will have warranty stickers to avoid any fraudulent clams. Type: Notebook/LaptopBrand: AORUSProcessor: Intel Core i7 5th Gen. When the world is hyped about AI, you as an individual should ask and think what AI can really do for you. GIGABYTE went a step further by adapting the perspective and experiences of our users, which lead us to cooperate with Microsoft Azure to bring you the world’s first “Edge AI” and “Cloud AI” laptop - the AORUS 15. 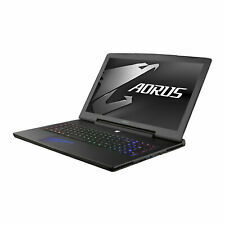 AORUS X5 V8 15" 144Hz Full HD GSYNC 6 Core i7 GTX 1070 Gaming Laptop. The wait is over. AORUS Overclock: Laptop Overclocking Made Easy. It is mind blowing to know that the insanity does not stop here. 13.9" AORUS X3 Plus R7-CF1, Quad HD, i7 7700HQ, GeForce GTX 1060 Gaming Laptop AORUS E1 In-Ear Gaming Headset. Gear up for Combat with this AORUS X3 Plus Gaming Laptop & AORUS E1 In-Ear Gaming Headset! I've only owned this laptop a few months and I have looked after it always in protected case that's included. This laptop is amazing isnt even that heavy for the power it has and looks amazing with no Mark's on it what's so ever. AORUS 15-X9-7UK0250W. All these high-performance parts work together seamlessly, so that you can concentrate on more important tasks at hand. When the world is hyped about AI, you as an individual should ask and think what AI can really do for you. AORUS 15-W9-7UK0252W. All these high-performance parts work together seamlessly, so that you can concentrate on more important tasks at hand. When the world is hyped about AI, you as an individual should ask and think what AI can really do for you. Brand: AORUSProcessor: Intel Core i7 8th Gen.
All these high-performance parts work together seamlessly, so that you can concentrate on more important tasks at hand. The wait is over. The new generation AORUS 15 take it to the next level by designing 50% of the base surface area as vent intakes, in addition with 6 specially designed heatpipes, 7 exhausts vents and dual powerful fans. Aorus 15-X9-7UK0252W. All these high-performance parts work together seamlessly, so that you can concentrate on more important tasks at hand. When the world is hyped about AI, you as an individual should ask and think what AI can really do for you. Aorus 15-X9-7UK0250W. Manufacturer Code: AORUS 15-X9-7UK0250W. AORUS 15-X9-7UK0250W. 512GB M.2 SSD. Solid State Drive 512GB M.2 SSD. Hard Drive Not Included - 512GB SSD. 16GB DDR4 RAM. Network Card 10/100/1000 Killer LAN Gigabit Fast Ethernet. Aorus 15-W9-7UK0252W. Manufacturer Code: AORUS 15-W9-7UK0252W. Hard Drive 2000GB. Solid State Drive 512GB M.2 SSD. 16GB DDR4 RAM. Network Card 10/100/1000 Killer LAN Gigabit Fast Ethernet. RAM 16GB (DDR4). Aorus 15-W9-7UK0252W. All these high-performance parts work together seamlessly, so that you can concentrate on more important tasks at hand. The wait is over. The new generation AORUS 15 take it to the next level by designing 50% of the base surface area as vent intakes, in addition with 6 specially designed heatpipes, 7 exhausts vents and dual powerful fans. Aorus 15-X9-7UK0252W. Manufacturer Code: AORUS 15-X9-7UK0252W. AORUS 15-X9-7UK0252W. 512GB M.2 SSD 2000GB HDD. Hard Drive 2000GB. Solid State Drive 512GB M.2 SSD. 16GB DDR4 RAM. Network Card 10/100/1000 Killer LAN Gigabit Fast Ethernet. The new generation AORUS 15 take it to the next level by designing 50% of the base surface area as vent intakes, in addition with 6 specially designed heatpipes, 9 vents and dual powerful fans. All these parts works together to dissipate the heat generated by the CPU and GPU in order to create the coolest and stable performance gaming laptop by AORUS. Our ref: RN1299. - Model: X7 Pro Sync-CF2. We do not know if the laptop has had any previous repairs or not. - HDD & SSD are not present and are not included in the sale. Laptop may be missing screws. Only difference is this version has the GTX 870M and the faster i7-4860HQ processor. Great lightweight gaming laptop. Apart from a bit of wear on the edge of the keyboard deck, it is in excellent condition - no marks on the screen, base or lid. Type: Notebook/LaptopBrand: AORUSProcessor: Intel Core i7 4th Gen.
Aorus 15-X9-7UK0252W. All these high-performance parts work together seamlessly, so that you can concentrate on more important tasks at hand. The wait is over. The new generation AORUS 15 take it to the next level by designing 50% of the base surface area as vent intakes, in addition with 6 specially designed heatpipes, 7 exhausts vents and dual powerful fans.